This time of the year means different things to different people, but for us it's warm days of abundant sunshine, generally cool evenings, and dips in the mountain spring-fed pool. And it's also time to think about harvesting the first of several batches of basil in the next few days and making pesto. Two caveats: Pine nuts not harvested and processed in China (which exports too many contaminated foodstuffs for our taste), are outrageously expensive, but there really are no substitutes if you want a genuine pesto taste. 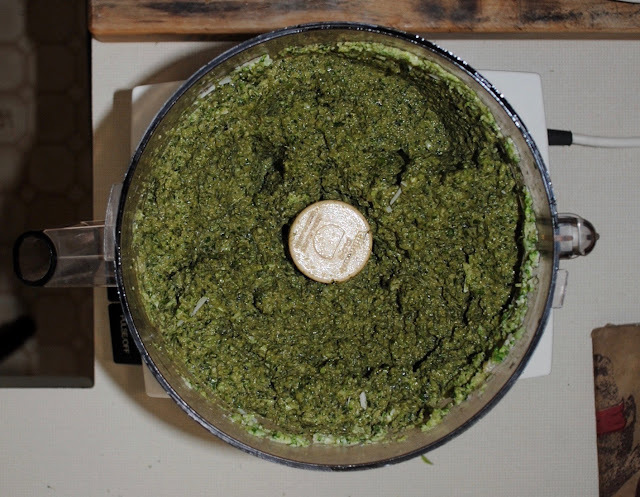 And making single-serving batches of pesto is labor intensive, so our recipe is for a larger quantity. 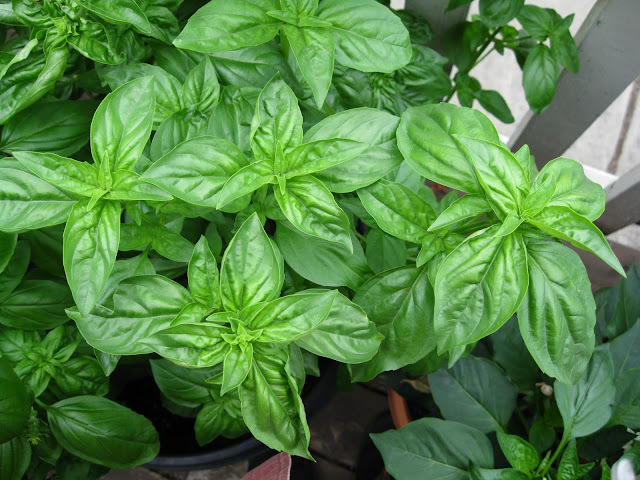 This means shopping for basil at a farmer's market or co-op farm if you don't grow it in quantity yourself, although those harvests usually don't come until later in the summer. 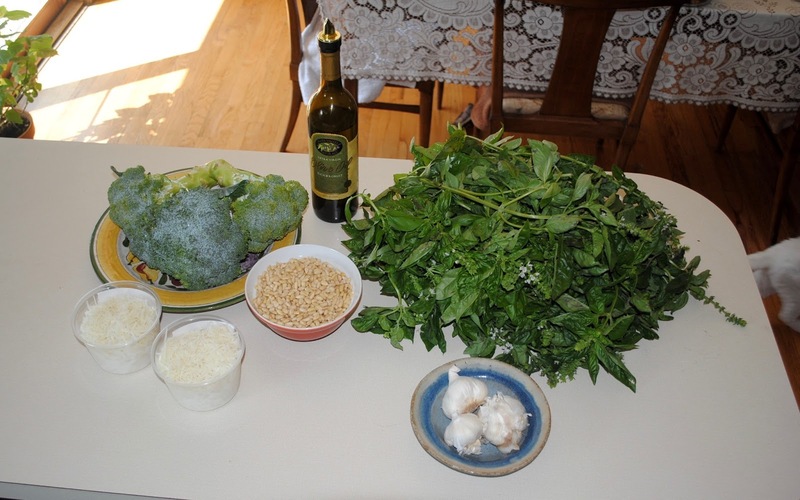 The following recipe can be reduced by half, or for that matter any amount, but the idea is to make pesto in bulk. 3 Full-leafed basil plants = 10 cups of slightly compressed basil leaves with stems and any flower heads removed. Depending on the size of your food processor, make pesto in one or two batches by first putting the pine nuts and garlic cloves in, pulse until they have begun to break down, then add the basil, chopped broccoli, olive oil and cheese to the mix and resume pulsing until the ingredients are thoroughly mixed but not pureed. Do not be concerned if it appears that you have more basil than the processor can handle. Basil is mostly water and will soon break down and fit comfortably in the processor. Taste and add a bit more oil and cheese, if needed or desired. This recipe makes 4 cups of finished pesto. One cup is perfect for a pound of pasta, so put that aside for the evening meal. At serving, drain the cooked pasta, put it back in the pot immediately and thoroughly stir in the pesto. Sprinkle servings at the table with additional cheese, if desired. Put the remaining three cups in freezer bags and freeze them. Pesto freezes beautifully and you'll have the pleasure of a delicious green meal in the dead of winter. I love pesto but have never made my own. It sounds delicious and quite healthy. Thanks for this. I will attempt a batch with my basil.